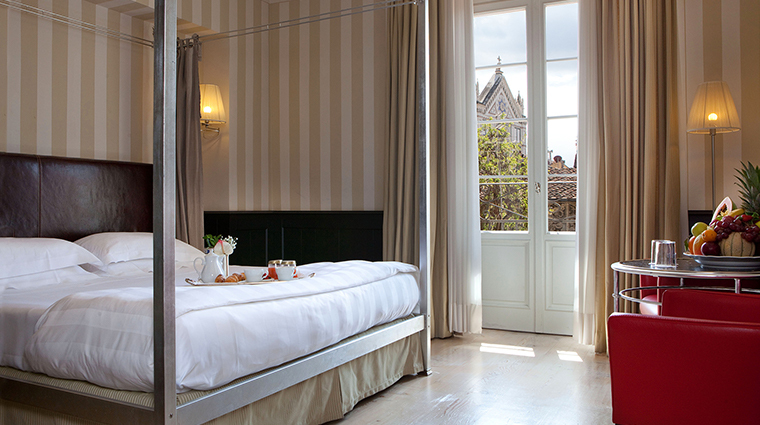 A “home away from home” may sound like the ultimate hotel cliché, but few words are more fitting for Florence’s Relais Santa Croce. 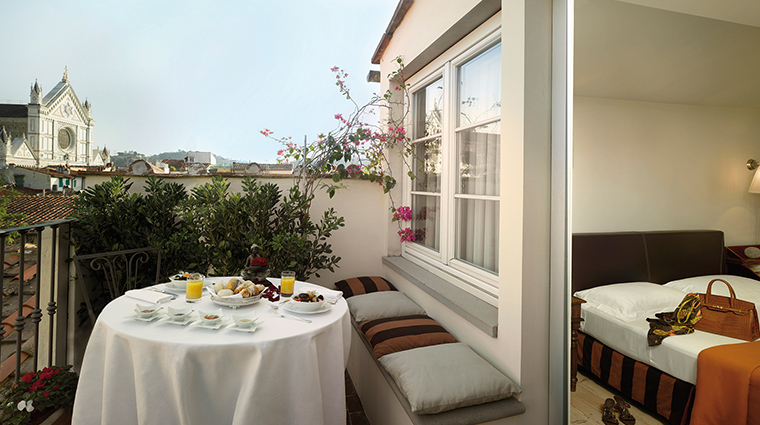 In the heart of the historic center on via Ghibellina — a main drag fusing the best of medieval and modern Florence — this hotel was a private residence for the Florentine elite until as recently as 2005. Today, it maintains the atmosphere of an aristocratic home, but one where you feel perfectly at ease and without the stuffiness that comes with these types of grand, historical environs. 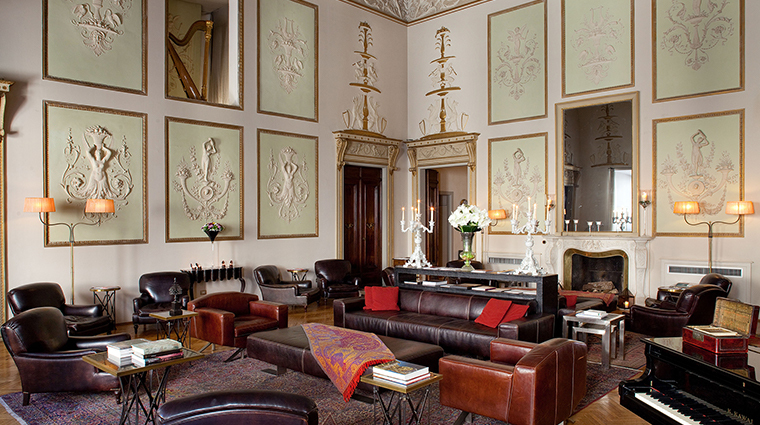 Frescoed ceilings, gilded mirrors, delicate stuccos and elaborate rugs remind you that you’re in an 18th-century palazzo, while cozy armchairs and cheerful staff will see to it that you feel completely comfortable. 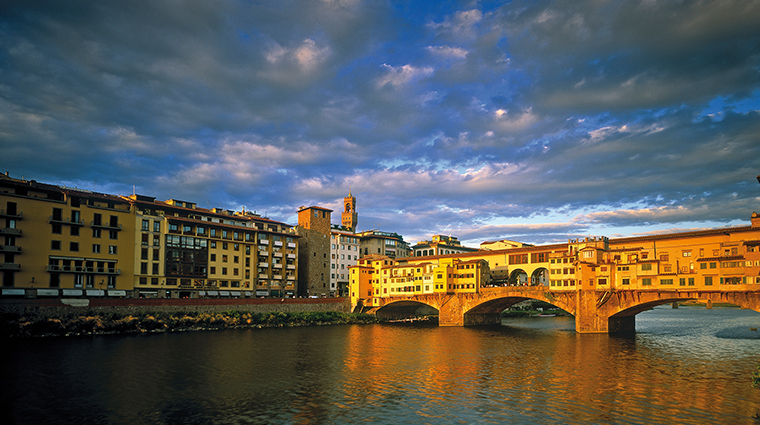 You’ll be right in the thick of things on one of the city’s longest and liveliest stretches, lined with wine bars, restaurants, shops and — in true Florentine style — countless family crests, tabernacles and towering Tuscan doorways. Guelfi e Ghibellini is the hotel’s modestly sized but refined restaurant, named for the different factions in the medieval power struggle between the papacy and the Holy Roman Emperor (if it’s in Florence, it has a backstory). 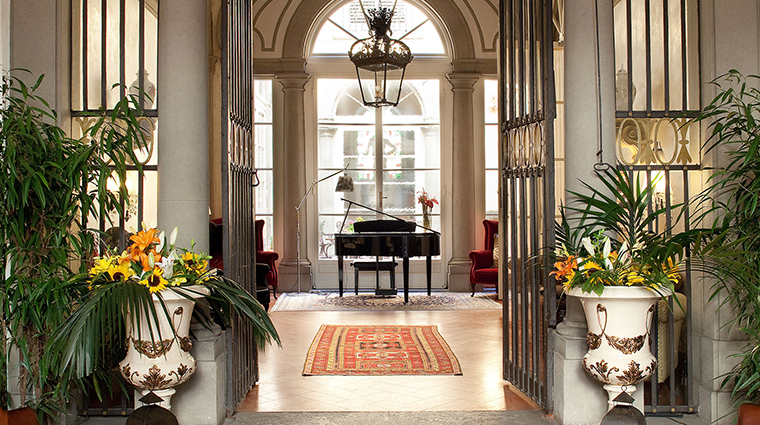 Another buzzworthy bonus is the Florence hotel’s atmospheric Sala della Musica, a piano lounge area that serves aperitivo and occasionally transforms into a temporary theater. Three key highlights nearby are the Bargello Museum, which houses a remarkable collection of Renaissance sculpture; the Basilica of Santa Croce where Michelangelo, Galileo and Machiavelli are all buried; and the Teatro Verdi, where the packed programming runs the gamut from magic shows to Madame Butterfly. Though via Ghibellina is part of the well-beaten path, it lacks the chaos and crowds you often find in the major shopping streets and monumental squares. After dark, the street is safe and well-lit; pedestrian traffic is steady, but nightlife noise is minimal. The popular Enoteca Pinchiorri on the ground floor of the Florentine hotel is not managed by the Relais Santa Croce, but still makes an appealing option for a fabulous meal. The boutique hotel has several different types of rooms and most have a classic/contemporary feel despite the age of the setting — there is both a sense of history and modernity. Tuscan marble bathrooms are standard throughout most of the luxury hotel, and the diverse bedroom décor takes inspiration from manifold Florentine traditions, including well-known pharmacies and perfume shops. 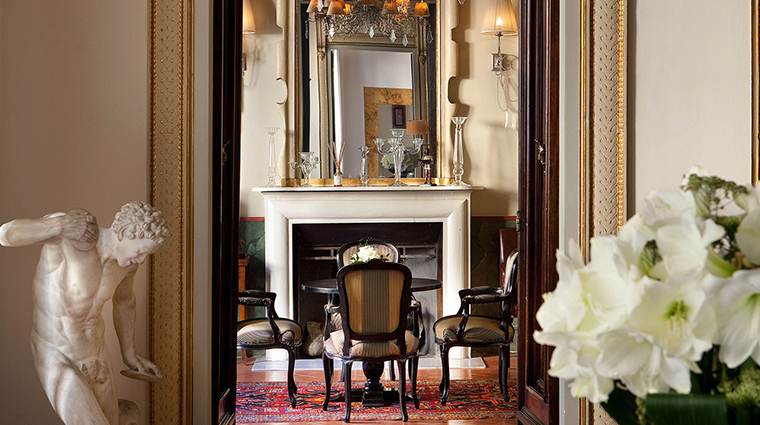 Tailored touches and classic Tuscan décor can be found in the Verrazzano Royal Suite, made up of two salon-style living spaces and a large bedroom, all furnished to fit the tastes of high-flying Florentines. Beyond the coffered ceilings and period artwork, this palatial suite also affords you your own workout equipment and Turkish steam bath. The cuisine at Guelfi e Ghibellini is classic Tuscan, which means the menu shifts seasonally and many of the guiding principles go back to traditional peasant cooking based on fresh, simple, flavorful ingredients. Presentation, however, always comes with a contemporary twist, courtesy of the innovative chef Fabrizio Innocenti. He manages to both respect his Tuscan roots and experiment with techniques from around the globe. Divided in two sections, one of which can double as a meeting room, the restaurant is open nightly for dinner. For another fine wining and dining option, head to the famed Enoteca Pinchiorri on the ground floor, which pulls in many hotel guests.